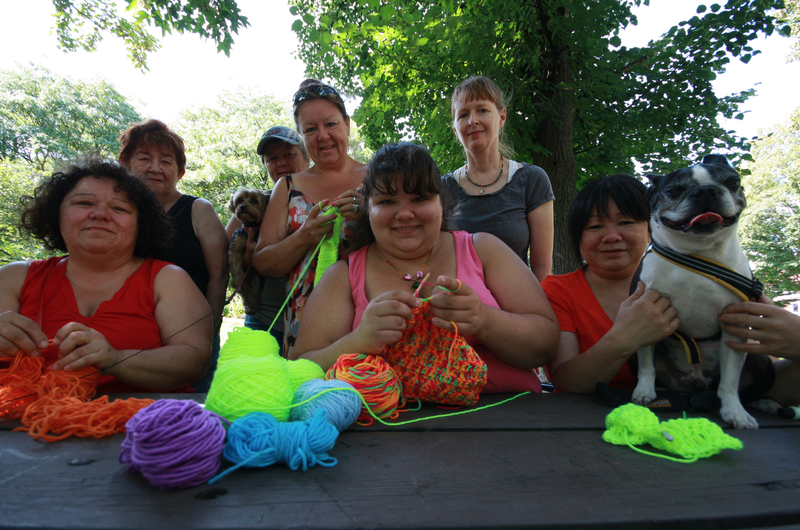 Armed with yarn but hardly dangerous, members of the O-Town Bombers gather on the outskirts of Dundonald Park shortly after high noon on Sundays. I find them resting in the shade at a wooden picnic table, visibly at ease as they banter while their hands silently crochet. A thick band of knitted wool is wrapped firmly around a nearby tree, marking their territory — non-permanently of course — on this small portion of their Centertown turf. “You will learn how to crotchet,” says Dennis, firmly. As the others begin to make room for me at the table, Dennis digs through a pencil case and hands me a crochet hook. By her tone of voice it is clear that her terms are non-negotiable. Justy, her hair kept short but with rebellious curls, guides me through the first few steps of crotchet as she demonstrates a variety of loops and pulls with a single strand of wool, ushering it with finesse and precision. It’s fair to say the O-Town Bombers have gained a reputation in Ottawa since the group first banded together in May 2012. Hearing about the Bombers mainly through media and word-of-mouth, a few fans stop by at the picnic table throughout the day. Curious bystanders also stop and watch, usually from a distance. 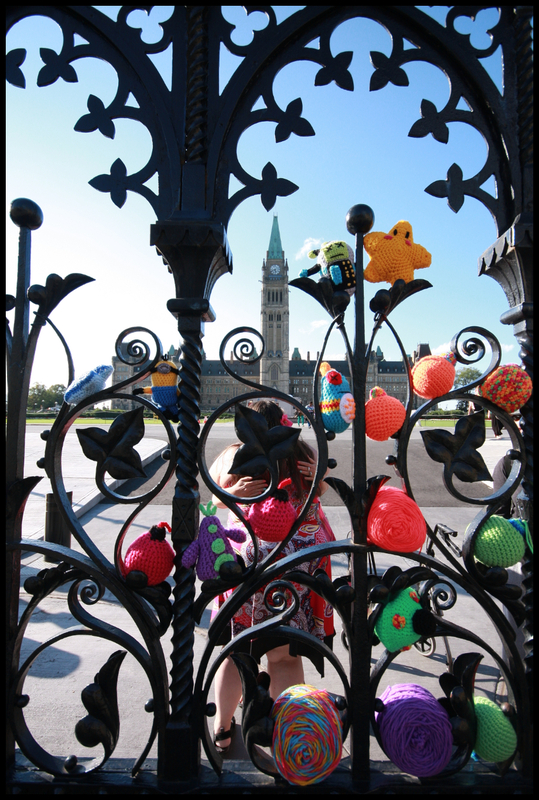 Yet the Bombers’ yarn-related antics have also earned them a bad wrap among some folks in the National Capital Region, particularly law enforcement and city officials after a string of public yarn bombing events. “We’ve been called mischief makers by the RCMP and the city calls us vandals,” she says. “But I’ve looked up the definitions and what we do isn’t vandalism or mischief,” adds Knight, explaining that the real battle is largely semantics. The O-Town Bombers stop short of calling their yarn bombing activities a form of activism. Many of them have a background in various forms of art and arguably, decorating urban landscapes with temporary, yarn-based graffiti gives the Bombers a creative outlet. As I sit with them, their adventures in yarn bombing capture a sense of excitement and satisfaction, especially on occasions when they’ve shared their wool with the public. “Is there a point to yarn bombing?“ asks Justy, taking a moment to consider the question. A somber moment falls over the clan as they recount a recent undertaking that quickly turned sour once the police showed up. Everything had to be torn down before it was finished, including a variety of hanging flowers and butterflies created by crochet. Careful not to give the impression that the entire city of Ottawa is out to get them, Knight offers her account of the incident. “He [a police officer] was young, cute, and very apologetic,” she recalls. “He really didn’t want to bust us,” says Knight, rather sweetly. The other Bombers are quick to join in, unable to maintain the chorus as the lyrics splinter into fits of laughter. “We learned a valuable lesson from that one,” explains Justy. “Get in. Get it done. Get out,” she says, her eyes wild. Yarn bombing certainly isn’t unique to Ottawa. The earliest record of the movement traces back to Magda Sayeg, of Houston, Texas, who in 2005 recruited a collective of yarn bombers and transformed urban landscapes using wool. “What she did to that bus [in Mexico] is just amazing,” says Justy, explaining that Sayeg continues to yarn bomb in a variety of major cities and that her work, along with others, is a source of inspiration for the O-Town Bombers. Limited by their numbers, imaginations, and perhaps municipal by-laws in some regions, yarn bombers across the globe have left no piece of public infrastructure untouched. Trees and fences are the most likely targets. Larger yarn bombing campaigns have also filled cracks in pavement, covered buses, bridges, statues, and military tanks. Images for many of these events are posted on the web, including the O-Town Bombers’ Twitter and Facebook pages that have their own local handy work too. “Social media has been great for connecting with other people,” explains Knight. “And it’s good for people who don’t get to see [our work] before it gets taken down,” she adds. The women continue to muscle their way through yarn effortlessly, fingertips racing towards an upcoming event: Nuit Blanche 2013 in Ottawa + Gatineau. “We’re yarn bombing twenty-four trees on George Street, in the Market,” says Justy. Embracing the supernova-themed event, O-Town Bombers intend to cover one tree in white wool, representing the start of the supernova, while the other trees will be wrapped in large wooly flaps of neon yarn. “We crotchet [instead of knitting] because more air flows through it,” says Mimi Golding, explaining why crochet is better for yarn bombing compared to the tighter knots that are characteristic of knitting. A plastic measuring ribbon is pulled out occasionally to ensure the crochet pieces are made to a standard width and length. “We like to share too,” she adds, noting events when the public has been encouraged to take a piece of wool home with them. “You end up giving away most of what you create,” says Golding “You’re not going to make money off yarn bombing . It has its own value system,” she says. It’s clear that these spools of yarn have a bonding effect, not just among the Bombers but also newcomers and sightseers. Within an hour, the group slowly surges to more than a dozen people, mostly regulars and a few new faces. “I love it,” says Shauna Wong, a first-timer who brought Charlie, her Boston Terrier. “I’m known in my neighbourhood for walking and knitting at the same time,” admits Golding, unapologetically. Her confession seems to earn her respect among the others as they continue to crochet and knit at the table. “I’ll knit when I’m on a bus,” Golding continues, pausing for a moment. 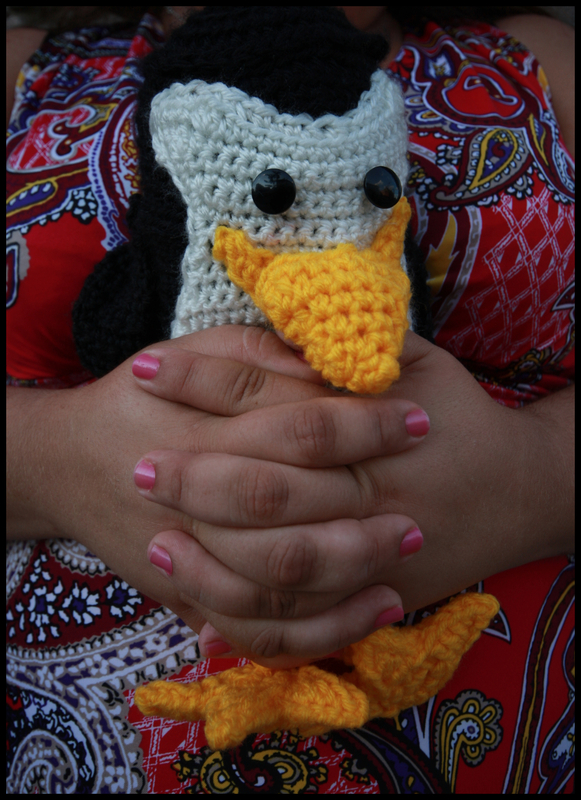 “I knit while attending conference calls or standing in long line-ups,” she adds. “Instead of being annoyed about waiting, I can be productive,” she concludes. Golding advises to take on small projects because they are more convenient and also portable. “I have a lot of UFO’s,” says Golding, noticing that I haven’t followed her train of thought. “UFO stands for UnFinished prOjects. That’s the lingo,” she smiles. bombing event planned to coincide with “I Love Yarn Day” on October 11. “There’s enough room for everybody when it comes to yarn bombing,” says Justy, offering more insight as to what motivates them. “Other crafts are expensive,” she explains. “This [yarn] is reasonably affordable for the average person,” Justy adds. “There’s also nothing elitist about crocheting,” says Knight. “But being humble has nothing to do with it,” she laughs.